ABUKAI Blog: ABUKAI Flies High in Asia Pac! ABUKAI Flies High in Asia Pac! The market for smart phones is very much on the rise in Australia and the rest of the Asia Pacific region. And with that trend, the need and use of mobile applications and productivity services like ABUKAI Expenses is similarly growing…in many cases, outpacing countries elsewhere around the globe. To address the needs of this burgeoning market, ABUKAI is fortunate to have Phil Kemper, our sales director for Asia Pacific headquarted in Australia. 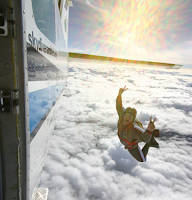 A veteran of technology sales, Phil also is also a veteran of over 550 skydives and has spent about 7 hours in various wind-tunnels across the world. This is the equivalent of approximately 700 skydives. 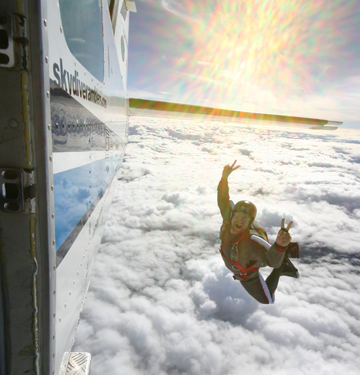 An accomplished skydiving instructor, Phil teaches people who have never before jumped out of an airplane to ‘voluntarily’ step out of a plane at 14,000 feet, have a controlled flight in the air and parachute to a safe landing. He says this is great fun and very rewarding! So whether you need ABUKAI Expenses here on the ground, or up in the air, Phil, and ABUKAI have you covered!